I just signed up for the Grapes of Rock half marathon in June. To kick off my training, I’m taking a rest day. I briefly debated running with Baby A this morning but I came up with a really good excuse excuse to skip it… My favorite running pants were still wet after doing laundry last night and my husband was sound asleep in the bedroom, which contained all of my other running gear. I didn’t want to wake him. How considerate I’ve suddenly become! Seriously, I rode 10 hilly miles on Friday and ran almost five miles yesterday so I decided that my knees could use the break today. The past several weeks have been touch and go in the exercise department. I did get back on my Supersix again and rode to Cibo with my biking Divas! Then I missed several Baby Boot Camps because of our ever-evolving nap time. When I finally did attempt a class, I was informed by the other two women who showed up that the class time had changed. I did a remarkably good workout of exercises I remembered from class and added a few of my own (squats with Baby A, both holding him and holding his hands while we squatted together). After a couple weeks of home workouts, we left town again. Traveling with a baby is hard work but it certainly doesn’t count as a workout since my husband does most of the lifting, carrying and stroller pushing. I was feeling pretty smug and travel-pro-ish as I counted Baby A’s 18th flight Thursday. Until he screamed inconsolably for a good amount of time and disturbed the entire plane full of people. So much for “travels well with baby”. We spent a week of our time in Boston with my family. I was working and it was freezing cold and snowy. Long walks and long meals with my family were the free time pleasures. Then we went to NJ for Passover with my husband’s family. In between family time and delicious, enormous meals, I decided it would be really good for Baby A to have some gym playtime. Plus, I really needed to sweat. He loved the childcare at my in-laws’ gym and I loved the Techno gym skating machine, which nobody else in the gym ever seemed to use. I did three separate workouts on this machine then mixed it up with an “elliptical triathlon” on the fourth day. (Skate, bike, escalator steps) Last month I took a course at my Y on using medicine balls so my husband and I concluded each workout with several partner medicine ball exercises. I tried to remember correct form and as many of the silly looking exercises I could. We had a blast! Nothing like working out with a partner for extra motivation. I made an important decision during my final NJ workout. Feeling good about myself after a trainer complimented my exercise ball push-up form, I decided that I was finished with my post-baby stomach. Instead of just letting the flab be until after Baby #2 (no immediate plans) I want my old abs back. And I started working for it. I’m paying more attention to what I eat and I’m getting serious about my core work. So, there’s the recap of my past month. I plan on blogging more frequently during race training, so feel free pick a race and train with me! Another gorgeous day, another fun bike ride, and a new riding buddy! We rode across the bridge and down to the end of the Sausalito bike path, then back. Of course Cibo was a necessary stop on the way back. I’m happy to report that I didn’t have any mishaps with tourists today. They were thinner on the bridge than usual because of the fog. I did however realize that, while my new tires make me faster (I reached 30 mph on a flat today), they are tricky in wind. They have an aero design and even though the extra material is minimal, it is enough to catch our strong bay area winds. I almost wiped out at one point when I was cruising down a hill and the wind took control of my bike. Perhaps I’m too light for these wheels in the wind? Or maybe I just need to get used to controlling them! I came home and decided it was time to update my core work page. Doing all of the poses with a 10 second self-timed camera didn’t prove to be easy, but I did learn quite a bit about my form- and what I was doing wrong- from looking at the pictures I took! I finally rode with the girls again. It has been a long time! I almost missed it this morning, claiming yesterday during the planning that I couldn’t get up that early (still feeling jetlag), but decided to just make it happen. I’m always late getting to our meeting spot at the bridge. I know it takes 15 minutes from my house, but instead of allowing 20 so I’ll be there on time, I allow 10 and hope I can magically get there faster. I always arrive 5 minutes late. The bridge was empty on the way across and the bay was sparkling in the morning sunshine. I lagged behind, as is usual these days. I hate being the slowest but I guess not being the slowest would involve actually riding more and focusing on moving my legs faster! AC had to turn around at the end of the bike path and get to work, but me and RC continued on over the El Camino hill and into Paradise loop. We did the abbreviated version because I wasn’t up for the full 40 and, of course, stopped for coffee at Cibo on the way back. I couldn’t resist the fresh peach lemonade. I love summer fruit! The way back across the bridge was crowded and neither of us had remembered our whistles AC distributed to Team Diva in the spring. Oh well! RC lead the way and cleared the tourists out of our path. It’s nice to be home with a great workout finished and the entire afternoon stretched out before me. Getting up early really pays off! I have a whistle to use when I ride across the Golden Gate bridge but I never remember to bring it! This morning the bridge was swarming with oblivious tourists and the four of us did plenty of shouting and stopping as we made our way across. 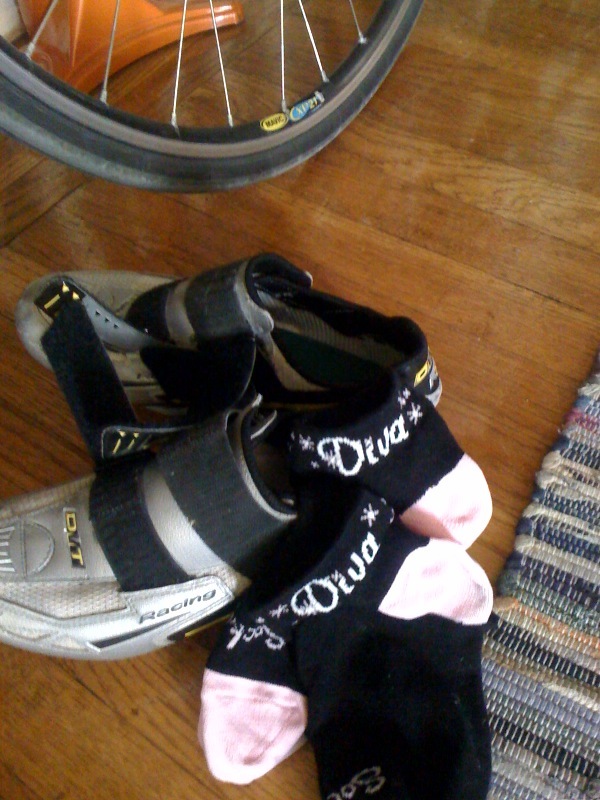 Team Diva rode a bit later than usual due to late night operas and early doctor appointments. It was windy and crowded for most of the ride but we did see sunshine in Sausalito. I wasn’t feeling tired as we began but now, a couple of hours later, I’m pretty sleepy and feel like I pushed myself hard. I got back into the pool yesterday to see where my body was in the recovery process after Sunday. My swim was short but felt good. Calves are still cramping a bit but much less sore than on Monday and I even took an hour tango lesson in heels yesterday afternoon with no negative results. Riding with the girls is so much fun and also pushes me to keep moving. Our goal today was the end of the Sausalito bike path then coffee at Cibo before our climb back up to the bridge. I was just focusing on keeping up and maintaining a smooth pedal stroke. I still haven’t stretched but that will be done after my rest!